An osteochondroma is classified into two types, i.e., either sessile or pedunculated and usually occurs within the metaphysis typically projecting away from epiphysis. Osteochondromas usually locate around the knee (50%) in which distal femur is the most common site. Osteochondroma is the most common benign bone tumor. 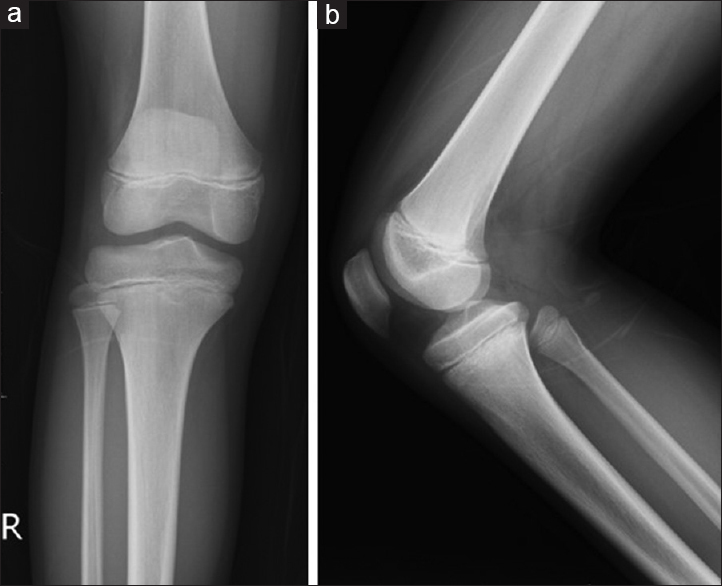 However, spontaneous regression of an osteochondroma is extremely rare. We present a case of a 9-year-old boy who complained of the anterior knee pain after trauma and was subsequently diagnosed with an osteochondroma of the distal femur that almost completely regressed within 4 years. The aim of the report is to discuss the possible mechanisms of this rare phenomenon. In addition, a review of the literature (involving 14 cases of spontaneous regression of osteochondromas of the distal femur) is also provided. A 9-year-old boy presented with a chief complaint of occasional right anterior knee pain over 3 months after he sustained a fall. He had no specific past medical or family history and denied taking any medication. He admitted to striking his right knee on the ground with a twisting, deforming force when he fell. On physical examination, a palpable, nonmobile, nontender lump over the lateral aspect of popliteal fossa was noted. Tenderness became worse while playing sports but subsided at rest. The appearance of the knee was normal without evidence of effusion. The knee joint showed the full range of motion and good stability. Lateral and anteroposterior radiographs [Figure 1] of the right knee showed a posterior sessile lesion within the distal femur. Although a definite pathological diagnosis was lacking, the lesion demonstrated the radiological characteristics of a solitary osteochondroma arising from the distal femur. As there were no radiological or clinical findings suggestive of malignancy (and given the lesion's close to the epiphysis), the boy was followed up and no treatment was given. Four years later, the pain had resolved clinically with full range of motion about the right knee. Repeat radiographs [Figure 2] of the entire right femur were normal. The previously demonstrated osteochondroma on the lateral aspect of the distal femur was no longer visible, confirming its spontaneous regression. 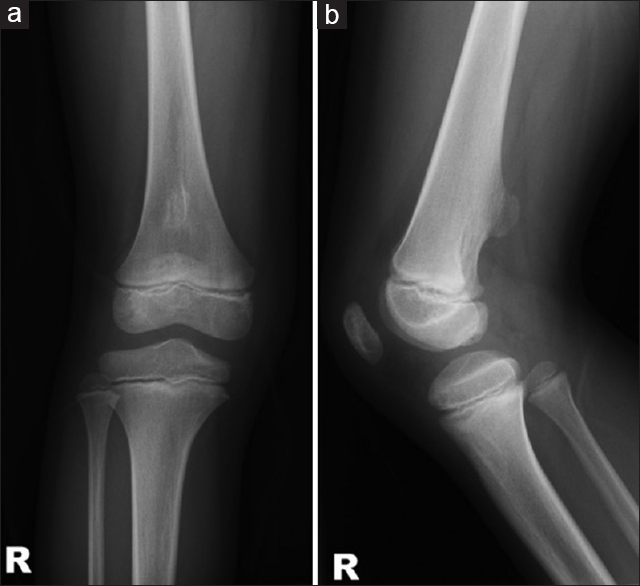 Spontaneous regression of an osteochondroma is very rare. The first case was published by Hunter in 1786 in his lecture series which were then published in 1835. From 1960 to 2014, there have been 23 published reports of spontaneous regression of osteochondromas with confirmed radiological findings.,,,,,,,,,,, We selected 14 of those cases which involved distal femur [Table 1]. Of note, most regressions were noted before skeletal maturity except two patients. Among these 14 patients, predominantly male, the average age at the time of diagnosis was 9.7 years with the eldest being 15 years old. The observed mean duration of spontaneous regression was 3.3 years. Morphologically, nine lesions were characterized as sessile appearance and the rest five were documented as pedunculated. Thus, although there were only 14 cases in the literature of solitary osteochondromas of the distal femur that had spontaneously regressed, the majority of these lesions were sessile and occurred in young males. Three possible mechanisms may explain the spontaneous regression of these lesions: (1) skeletal maturation is followed by the cease of osteochondroma and lesion was fused into growing metaphysis; (2) bony repair and remodeling process following a fracture was associated with an interruption of blood supply; a fracture of the stalk of a pedunculated osteochondroma may have accelerated resolution of the lesion; and (3) resorption of an osteochondroma occurred due to the presence of an accompanying pseudoaneurysm. Our patient was diagnosed with a sessile osteochondroma at the age of 9 that regressed spontaneously before skeletal maturity, supporting the first theory. However, our case also had a history of the previous trauma and knee contusion. Although there was no obvious fracture of the sessile lesion in the distal femur on radiographic images, a microfracture of the lesion may have affected the blood supply to the osteochondroma, supporting the second theory. This case report demonstrates that a solitary osteochondroma of the distal femur can spontaneously regress especially if the lesion is a sessile osteochondroma in a young male. Due to this type of osteochondroma can resolve spontaneously, conservative treatment is always the first choice to avoid unnecessary surgery. Passanise AM, Mehlman CT, Wall EJ, Dieterle JP. Radiographic evidence of regression of a solitary osteochondroma: A report of 4 cases and a literature review. J Pediatr Orthop 2011;31:312-6. Mahmoodi SM, Bahirwani RK, Moosa NK, Eydou AZ, AbdullGaffar B. Spontaneous osteochondroma resolution in a young female: Imaging and histopathological findings. Med Princ Pract 2010;19:228-31. Hunter J. The Works of John Hunter, with Notes by JF Palmar. London: Longmans; 1835. p. 533-4. Valdivielso-Ortiz A, Barber I, Soldado F, Aguirre-Canyadell M, Enriquez G. Solitary osteochondroma: Spontaneous regression. Pediatr Radiol 2010;40:1699-701. Oyama Y, Yakushiji T, Sato H, Oka K, Mizuta H. Spontaneous regression of osteochondroma. A case reports. Plast Surg Disaster Surg 2011;60:705-7. Deprez FC, Beltrán-Marín M, Malghem J, Menten R, Clapuyt R. Solitary osteochondroma: Spontaneous regression. JBR-BTR 2011;94:217. Hill CE, Boyce L, van der Ploeg ID. Spontaneous resolution of a solitary osteochondroma of the distal femur: A case report and review of the literature. J Pediatr Orthop B 2014;23:73-5. Paling MR. The “disappearing” osteochondroma. Skeletal Radiol 1983;10:40-2. Copeland RL, Meehan PL, Morrissy RT. Spontaneous regression of osteochondromas. Two case reports. J Bone Joint Surg Am 1985;67:971-3. Merle P, Rougier JL, Duclos AM. Evanescent exostoses: a report on one case. J Radiol. 1980;61:291–292. Rosa MA, Cianfanelli M. Evolutionary behavior of an osteochondroma: spontaneous regression. Arch Putti Chir Organi Mov 1985;35:373-6. Reston SC, Savva N, Richards RH. Spontaneous resolution of solitary osteochondroma in the young adult. Skeletal Radiol 2004;33:303-5. Choi JY, Hong SH, Kim HS. Resorption of osteochondroma by accompanying pseduoaneurysm. AJR Am J Roentgenol 2005;185:394-6. Arkader A, Dormans JP, Gaugler R. Spontaneous regression of solitary osteochondroma: reconsidering our approach. Clin Orthop Relat Res 2007;460:253-7.